Hey all! So I did not get a chance to post my second Garden layout from Two Peas In A Bucket yesterday. Sorry about that! I had the best of intentions but time just got away from me. Seems like the story of my life lately. sigh. My youngest son Brandon had so much fun making (and eating!) S'mores that we made at an end of season barbeque a few months ago and I just had to capture the memory on a layout. 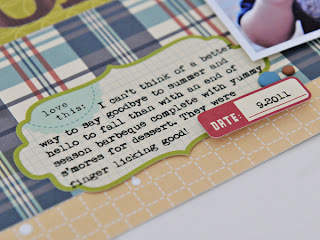 I used a combination of older and newer products from one of my favorite manufacturers October Afternoon. 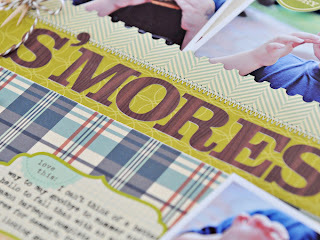 I love the plaid patterned paper from the Campfire collection and based my color scheme for this layout on the colors found in this great plaid. I love these big woodgrain patterned alphabet stickers from October Afternoon. They were perfect for my big, bold title. This label sticker is from the Sidewalks collection from October Afternoon. I love it. Really, really love it. It's the perfect size for a bit of journaling and has a fun shape and splashes of color. Such a gorgeous layout! Il est tellement craquant ton petit garçon, vraiment trop beau! Sorry, my english is not good so I mix English and French... LOL! I just love the papers you used! 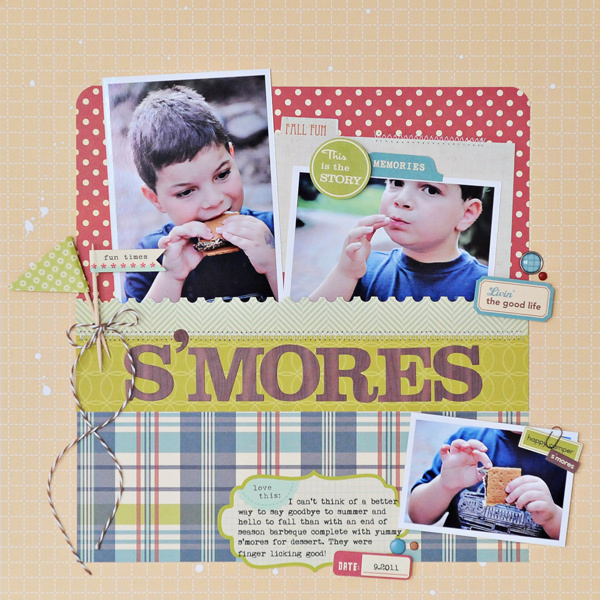 And those pictures are just ADORABLE--great layout! Awesome! Fab design! Love your little flags!